Meet the Housewives of Sydney. They are wealthy, elegant, poised, and constantly in the public eye. But what goes on behind closed doors, in the private homes and parties where the cameras and paparazzi aren’t welcome? Delve into the most personal details of their relationships, their friendships and their lives. The only question is: can you handle the heat? 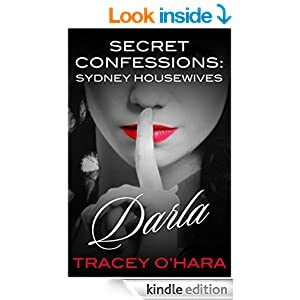 Darla knows her place at the exclusive Diamond D dinners – she is comic relief, entertaining the rest of the women with tales of her dating woes. Since her divorce, she has been on one bad date after another, and not even a high-class dating agency can help. But a massive storm front brings a visit from an old neighbour – and suddenly being neighbourly takes on a whole new meaning. When it rains, it pours, and it looks like Darla’s dry spell is about to become a thing of the past. Darla is single and looking for Mr. Right, we learn sometimes he is right under your nose. Her neighbor is an American named Hunter. When he shows up for and surprises her. She finds out that Hunter has feelings for her and he isn't afraid to show her. Hunter is a dream - a man who isn't afraid of being a man, but knows how to treat a woman! The only reason I haven't given it higher is it is such a quick read the characters didn't have the time to develop. But, Ms. O'Hara is a wonderful story teller. If you are looking for a quick hot ride, this one is worth it.